Bookmarks make great bridal shower favors. As an avid reader, I love getting bookmarks! Even if your guests aren't particularly readers, I think bookmarks are such a very pretty gift that can be used over and over again, and last for a long time. I think bookmarks are the way to go for bridal shower favors, as they can be designed to coordinate with any party theme. They can also be customized with the bride and groom's names and their favorite saying, poem or verse. 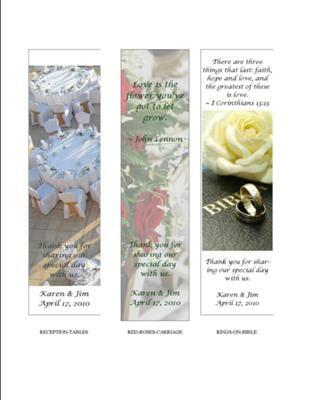 Put a favorite background on the bookmark or even their engagement photo with their wedding date. And who doesn't put magnets on their refrigerators? Just add a magnet to the back of the bookmarks. If your guests aren't bookworms, they'll always have a beautiful magnet to remind them of the special event. Many couples are trying to find a small and inexpensive favor to give their guests. These are practical yet elegant, personalized favors to give to their guests.